Pictured left to right in the front row is Interact Advisor Carol Pomares, Interact Treasurer Mansi Gupta and Interact Vice President Jenny Sink. Back row is RYLA chair Paul Burke, Interact Advisor Wayne Lowery and Club President John Knight. 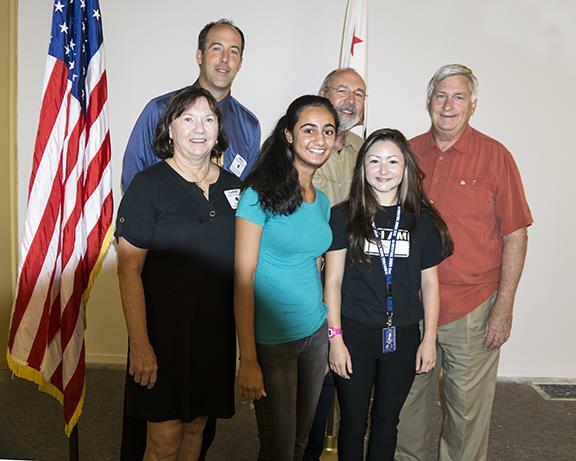 This summer we sponsored ORHS Interact officers Mansi Gupta and Jenny Sink to Camp RYLA (Rotary Youth Leadership Awards). At our breakfast meeting this week, August 20, a full house enjoyed their enthusiastic presentation about their life changing experiences at Camp RYLA. They cited examples about how they learned more about themselves, stretched what they thought were their limitations, developed leadership skills, increased confidence and gained a network of new friends. We are very proud of our two delegates and also of our Rotary sponsored Interact Club, which has approximately 160 members.